A plethora of nutrition rating systems are crowding the limited space on the front of food packages, and causing confusion in the grocery aisle. In October the Institute of Medicine (IOM) released the second of a two-phase analysis on front-of-pack (FOP) nutrition labels. 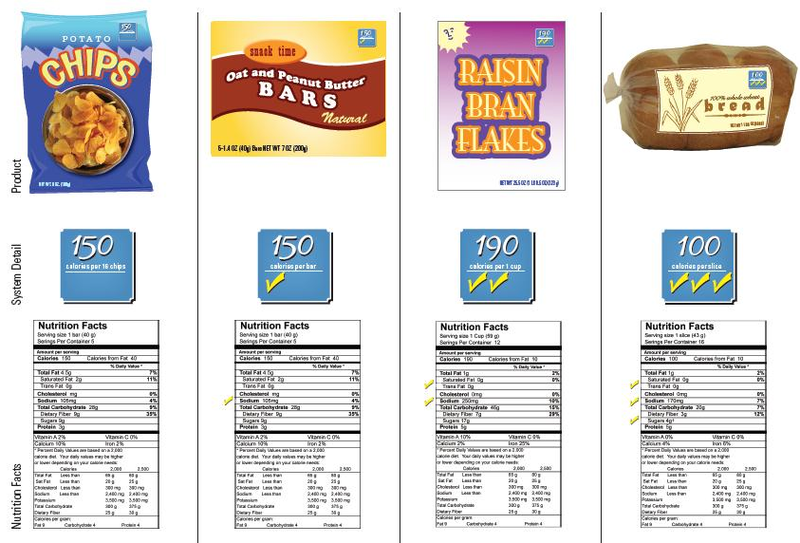 The report recommended a standardized FOP label system, featuring a prominent display of calories per serving, along with 0 to 3 nutritional “points” based on saturated and trans fats, sodium, and added sugars. Alice Lichtenstein, D.Sc., senior scientist at the Jean Mayor USDA Human Nutrition Research Center on Aging and Gershoff Professor at the Friedman School, served as vice-chair for the IOM Committee. Example of the IOM's proposed FOP label. The nutrition points are synced with the Nutrition Facts panel..
How did you become vice-chair for the IOM Committee? They called me and said the chair was going to be a behavior science person, and that they were looking for a nutrition person to serve as vice-chair. The idea of working with people in different type of expertise was very appealing, and probably why I accepted the position. How did the committee decide on the nutritional “points” system? We didn’t want to repeat what was on the back of the pack (Nutrition Facts panel). So we looked to other successful government systems such as the Energy Star program, the crash test program, the rating of mileage in gasoline for cars. We decided on a two-step approach. First, to decide if a food will get any points, based on the amounts of saturated and trans fat, sugar and sodium. Second, if the food is not above the cut point for any of the nutrients, then it is evaluated for qualification for 1, 2, or 3 points. It is important to note that the proposed system is tied to the Nutrient Facts panel. If an item gets a check, lets say, because it is low in sodium, a check would also appear near sodium on the back of package as well. Why did you omit beneficial nutrients from the label criteria? Because there’s very little indication that the US population is not consuming adequate amounts of those nutrients. The biggest public health challenge in the United States today is chronic disease risk. What was the greatest challenge for the committee during Phase 2? Well, I think we had to all feel comfortable with a single symbol. I was somewhat reluctant to go to a simple system. But by the end, I was convinced based on what has been learned about consumer behavior from other government-sponsored programs. And all of this work is for free? During Phase 2, the Grocery Manufacturers Association (GMA) came out with their Nutrition Keys labeling system. How did this affect the process? It didn’t affect it at all. Their labels are just one out of 30 or 40 systems out there. They shifted some of the information from the Nutrients Facts panel to the front of the package. Is it hard to remain confidential during deliberations while food industry moves ahead? No, I think those kinds of things always happen. There are a huge number of systems, and I suspect there will be more in the future. But it would be nice to see a unified system on all products in a consistent location on the package. Our prototypes were designed for FOP and shelf-tags—to accommodate certain foods that are not prepackaged—we feel that consistency of presentation is very important. I don’t think it’s ever going to cause someone to choose an apple over a potato chip. But hopefully within categories, like crackers or breakfast cereals, the label will be helpful. The next step would be for FDA to consider testing FOP symbols. What will be the hardest recommendation to fulfill in your report? I think it’s going to be difficult to come up with nutrient cut-off points for saturated and trans fat, sodium and sugar. There are some federal criteria currently available. That’s something that needs to be done within current regulatory environment. The GMA responded to your report saying, “We have concerns about the untested, interpretive approach suggested by the IOM committee.” What will it take to get food industry to get behind mandatory labeling? I don’t know. But I think they’re right; it’s untested and we need to get it tested. It’s probably the right time to take a fresh approach to FOP labeling. Now we need to see some innovative work on what we started, with particular emphasis on what it takes to encourage consumers to make healthier choices. Once that happens, I suspect industry will follow along by providing more choices in that category and it will be a win/win for everyone. What did you enjoy most about serving on this IOM committee? What I really enjoyed was working with people I don’t normally come in contact with. Those of us in nutrition were only focused on the nutrition information. But the people in health behavior were saying, “But look, it’s the details, you are not getting people to use it.” Also we were fortunate that the staff at the IOM is stellar. That makes a big difference. If you could convene a new IOM committee today, what topic would you like to tackle next? Oh, I’d like to go more into consumer behavior, to actually test some of the labeling systems and see if they effect purchasing. And if not, then work with an even broader group of behavioral experts to figure out how we can take the next leap forward in communicating nutrition information. Any other comments on your experience in the IOM FOP committee? Rachel Perez is savoring her last semester as a dual Nutrition Communications/Tufts Dietetic Intern, MS student. She is a dietitian and an aspiring journalist. Find her musings at Coconut Crumbs blog.